Each time you use the git resource within a new node, it causes duplication of the nav items as shown in the attached screenshot. This issue is not confined to the workflow+git combination. I have also seen it with the 'Show Build Parameters' plugin, where there is duplication of the Parameters link in the nav pane, but I can't seem to reproduce that issue consistently. I suspect that other plugins which add something to the nav field on a per-job basis could have similar issues. I'm attaching a support bundle from my MacOS test Jenkins server, and also a build.xml that shows the issue. JENKINS-29840 when workflow uses multiple git repos the "git build data" and "tags" become next to useless. [FIXED JENKINS-29326] Restore lost BuildData.equals override. SCM/JIRA link daemon added a comment - 2016-03-24 20:12 Code changed in jenkins User: Jesse Glick Path: src/main/java/hudson/plugins/git/util/BuildData.java http://jenkins-ci.org/commit/git-plugin/7e501ab38c60ad203cd5f1cdce8a9683c4fb89d8 Log: [FIXED JENKINS-29326] Restore lost BuildData.equals override. Did someone revert the fix? It's showing five for me. trejkaz added a comment - 2017-10-26 00:54 Did someone revert the fix? It's showing five for me. This is happening to me today on Jenkins 2.89.2 LTS with Pipeline Job 2.16. 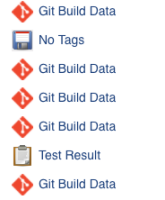 I've got 3 "Git Build Data" links in the left-hand menu (URLs ending in "git", "git-2", and "git-3"), and moreover, the main panel lists three Git revision SHAs that aren't actually part of my repository. This is a Multibranch Pipeline job building a pull request using the default "Merging the pull request with the current target branch revision" behavior. It also shows two Changes sections in the main panel listing the same Git commit message twice, in case that's relevant or related. Nick Jones added a comment - 2017-12-21 17:17 This is happening to me today on Jenkins 2.89.2 LTS with Pipeline Job 2.16. I've got 3 "Git Build Data" links in the left-hand menu (URLs ending in "git", "git-2", and "git-3"), and moreover, the main panel lists three Git revision SHAs that aren't actually part of my repository. This is a Multibranch Pipeline job building a pull request using the default "Merging the pull request with the current target branch revision" behavior. It also shows two Changes sections in the main panel listing the same Git commit message twice, in case that's relevant or related. May I ask why is this Priority: Minor? There are like dozens of duplicates of this issue (see e.g. JENKINS-38204 – the SVN lineage of dupes), and it looks like it's getting "fixed", then broken, then fixed again, then broken again... Is this an architectural problem in Jenkins? Can anybody fix this once-and-for-all? Max M added a comment - 2018-04-27 11:31 - edited May I ask why is this Priority: Minor ? Can this be escalated? There are like dozens of duplicates of this issue (see e.g. JENKINS-38204 – the SVN lineage of dupes), and it looks like it's getting "fixed", then broken, then fixed again, then broken again... Is this an architectural problem in Jenkins? Can anybody fix this once-and-for-all?